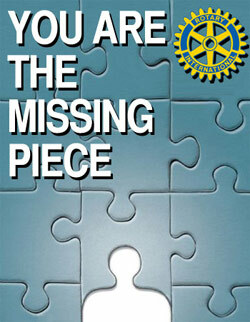 You are here: Home / What’s Rotary? Rotary International is the world’s first service club organization, with more than 1.2 million members in 33,000 clubs worldwide. Rotary club members are volunteers who work locally, regionally, and internationally to combat hunger, improve health and sanitation, provide education and job training, promote peace, and eradicate polio under the motto “Service Above Self”. As a club we are seeking individuals who are interested in volunteering their time, and in return getting back the satisfaction of knowing they are not only helping their fellow man but building friendships and business relationships. We want people who will actively contribute to our club and who aren’t just joining to push their own agenda, rather those of Rotary and all it embodies. To participate actively in Club Activities & Committees. Strive for 100% Attendance, Minimum 60%, Make-Up at Other Clubs. Active Members: $160 dues. (Prorated based on when you join). Regular meeting fee of $20/meeting + charter night + changeover night billed quarterly, in advance. Credit for 10 missed regular meeting fees each 6 months. Must meet District requirement of 50% attendance (taking into account make-ups and participation at activities). Senior Active Members: $160 dues (Prorated based on when you join) and no attendance requirement. Pay meeting fees. Board will determine for each situation whether to bill quarterly (with full credit for missed meetings) or pay at door. Associate Member: $450 dues, (Prorated based on when you join) and attendance or sponsorship in at least 3 events or activities. No meeting attendance requirement. Each primary and secondary member shall pay meeting fee at door. Associate Members may not vote unless they serve as a Board Member. Associate Members may not however, serve as Line Officers. Honorary Member: No dues or attendance requirement. Pay meeting fee at door. The mission of The Rotary Foundation is to enable Rotarians to advance world understanding, goodwill, and peace through the improvement of health, the support of education, and the alleviation of poverty. The Foundation is a not-for-profit corporation supported solely by voluntary contributions from Rotarians and friends of the Foundation who share its vision of a better world. In 1917, RI President Arch C. Klumph proposed that an endowment be set up “for the purpose of doing good in the world.” In 1928, when the endowment fund had grown to more than US$5,000, it was renamed The Rotary Foundation, and it became a distinct entity within Rotary International. That year, the first Foundation program – the forerunner of Rotary Foundation Ambassadorial Scholarships – was established. In 1965-66, three new programs were launched: Group Study Exchange , Awards for Technical Training, and Grants for Activities in Keeping with the Objective of The Rotary Foundation, which was later called Matching Grants . The Health, Hunger and Humanity (3-H) Grants program was launched in 1978, and Rotary Volunteers was created as a part of that program in 1980. Polio Plus was announced in 1984-85, and the next year brought Rotary Grants for University Teachers . The first peace forums were held in 1987-88, leading to the Foundation’s peace and conflict studies programs. Throughout this time, support of the Foundation grew tremendously. Since the first donation of $26.50 in 1917, it has received contributions totaling more than $1 billion. More than $70 million was donated in 2003-04 alone. To date, more than one million individuals have been recognized as Paul Harris Fellows – people who have given $1,000 to the Annual Programs Fund or have had that amount contributed in their name. Such strong support, along with Rotarian involvement worldwide, ensures a secure future for The Rotary Foundation as it continues its vital work for international understanding and world peace. Donors of US$1,000 or more to the Annual Programs Fund, PolioPlus, or the Humanitarian Grants. Program, or people who have that amount contributed in their name, can be recognized as Paul Harris Fellows. Each new Paul Harris Fellow receives a commemorative certificate and a pin. After 20+ years of hard work, Rotary and its partners are on the brink of eradicating this tenacious disease, but a strong push is needed now to root it out once and for all. It is a window of opportunity of historic proportions. Your contribution will help Rotary raise $200 million to match $355 million in challenge grants received from the Bill & Melinda Gates Foundation. The resulting $555 million will directly support immunization campaigns in developing countries, where polio continues to infect and paralyze children, robbing them of their futures and compounding the hardships faced by their families. Do not join Rotary unless you are ready to commit time every week of your life to Rotary, it truly should be thought of as a life-long commitment. Do not join Rotary if you are only trying to make business connections and network. Do not join Rotary if you are not committed to making the financial requirements expected of all Rotarians. Do join Rotary if you want to make a difference in your community and the world. Do join Rotary if you want to make lifelong friendships here and abroad. Do join Rotary if you want to create business relationships having created those Rotary friendships and trust. Do join Rotary if you want to enrich your personal & professional life. Do join Rotary to Learn to Laugh to Share and to Serve. Membership is every Rotarian’s responsibility. Each new member must be proposed for membership by an active member of the club. If you know someone who has all the qualities of a good Rotarian and you’re an active member of a Rotary club, consider proposing that person for membership. If you know someone who doesn’t live in your community but would make a great Rotarian, complete the referral form (PDF or online). The person’s contact information will be forwarded to the appropriate district leadership for consideration. If you’re a current Rotarian who’s moving to a new community, complete the relocation form (PDF or online), and your information will be forwarded to the appropriate district leaders. Your current club can sponsor you for membership in a club in your new community. For full membership qualifications, refer to the RI Bylaws (PDF). Educating potential members about the basics of Rotary club membership provides them with realistic expectations regarding benefits and obligations. Clubs should inform potential members about club, district, and RI activities as well as the structure and history of Rotary.